~ Mystic Sky ~ | Medieval and Fantasy Roleplay Fashion for Second Life! Medieval and Fantasy Roleplay Fashion for Second Life! Sadly the sim my main store is located on is being sold :: insert sad face here :: but my loss is your gain. 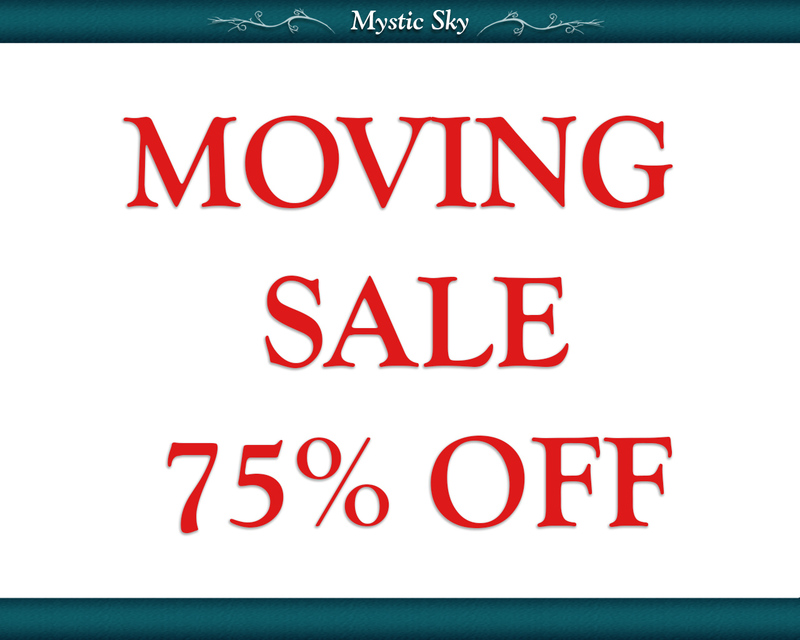 I have set all of my items to 75% OFF from now until the sim is sold (probably within the next few days). Now is the perfect time to grab a few outfits, everything in the store is priced between 25L to 112L !! I even marked down the bulk packs! See notecard for details. I will be moving most of my items to the marketplace in the near future and I will probably maintain a small in world location for new releases. My group will still be active for notices as well. Creating in SL is very near and dear to my heart and I would not have gotten this far creating in SL without your support. Thank you for your support over the years! The red and pink colors of the Miranda gown to 100 L’s in honor of Valentine’s Day. You can find them in the pond at the foot of the statue. I will leave them up until the weekend. The gown is made with hand drawn textures and an attention to detail. There are two skirt options included, a long ballroom skirt and a flirty knee high skirt. The skirts have a very natural flowing movement and they have a soft black netting lining their underside. There are sculpted ruffles and netting that line the bust, waist and thighs, they give the outfit a finished look. This dress also comes with a matching hair piece made of roses ruffles and netting. The dress is vibrant, flirty and only 100 L’s. 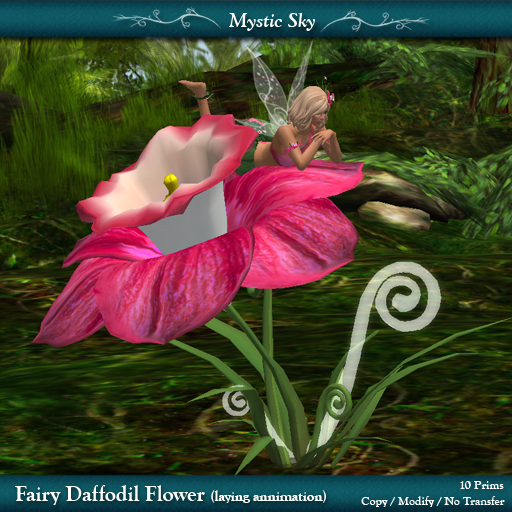 I know its been a loooonnnnggg time but A NEW PRIZE has been added to the ~Mystic Sky~ Lucky chair!!! The beautiful Resa babydoll dress in pink is available for a limited time to be won from the lucky chair. So get it while you can! 🙂 This outfit regularly sells for 450 L’s and is copy / mod / no trans. The sale ends Monday 2/6 at 10am slt, so hurry down here for some great savings!! I know, I know. I’m a bit late for Black Friday but its never to late for a sale! 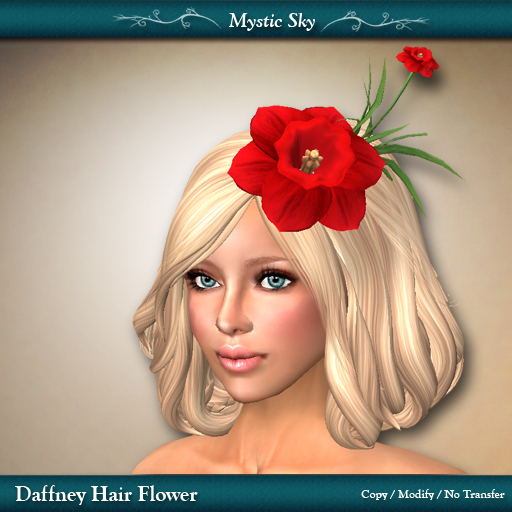 Daffney is a fairy themed outfit made with hand drawn textures and an attention to detail. Included are a hair flower, arm bands, anklets, wings (with fluttering animation), two skirt options (a ballroom skirt and a short skirt both of which come with a resize version) and the clothing is available in all clothing layers (shirt, pants, underpants, undershirt). It is playful and vibrant with a naturally flowing skirt and fluttering wings. Delicately accented with daffodil flowers and petals. Exclusive VIP Group Color (lavender) Available in the ~ Mystic Sky ~ VIP Updates group until the notice expires. There is a 250 L enrollment fee to join this group. I also boxed the hair piece seperate and added it to the accessory area on the second floor. 79 L’s Copy / Modify / No Trans. Available in 7 colors, see them all at the main store. Fairy Daffodil Flower with laying animation. An adorable place to rest your wings 🙂 There is one rezzed in the main store as a demo. 99 L’s Copy / Modify / No Trans. Available in 7 colors, see them all at the main store. I am participating in a small fantasy, medieval and formal themed hunt for the entire month of July. It is called ‘The Red Rose Hunt’. There is a red rose to hunt for priced at 25L and inside you will find an exclusive color of the Loralee Fae outfit, this color is not sold in the store. My dear friend Foxx Demonia is back and she is creating some wonderful new things. Some of you may remember her poses that were on display in my store. Well she is now creating some adorable accessories and jewelry. Her newest release is a fantasy themed circlet. Her new items can be found on the second floor of my store. Look What the cat brought!